The Copper Solvent Extraction, Electro-Winning (SX / EW) plant was acquired in 2007 from the Mount Gordon processing complex in Australia. It is located at the Usoke Ave processing facility in Lubumbashi. The facility was set up with an input capacity of 365,000 tpa of concentrate, producing copper cathode and cobalt salts. The plant is currently fed by a combination of output from the HMS plants, purchased concentrate and run of mine (ROM) material. The extensively modified front-end of the plant comprises a Metso jaw-crusher, cone crusher, ball mill and a screening system to allow wet material. The ore is then treated in leach reactors and counter-current decanters; extensive filtration and clarification systems (continuous horizontal belt filter) at this point remove most deleterious materials. Pregnant copper/cobalt solution is then treated in the Cu SX, where rich electrolyte is stripped and pumped to the Cu EW circuit. 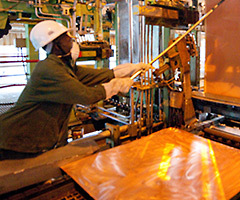 Copper is deposited onto Cathodes, and after completion of deposition cycles cathodes are stripped in an automated process. The residual solution is pumped to the cobalt section, where it is purified and by modifying the ph, cobalt salt is precipitated. The current feed enabled production of 15,223 tonnes of copper cathodes, for direct sale as pure copper metal in 2014. The plant has significant upside in capability and with the ramp up in feed provided by a concentrator is expected to reach 31,500 tpa copper. As more mineral assets are explored the plant has sufficient capacity to treat concentrate and ROM from these new assets.